A few months ago, I sent you a thank you letter and in it I promised to send you a photo of a child we were able to help with your donation. I am sorry it took me so long but I did not forget. 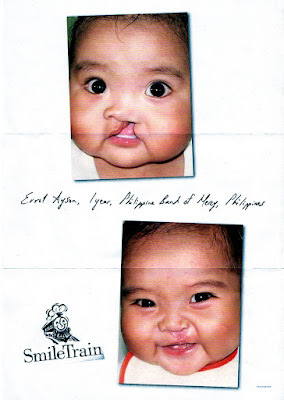 Please allow me to introduce Smile Train patient Errol Ayson. Errol is a one-year-old boy who lives in one of the poorest areas of the Philippines. His operation was performed by Dr Gilbert Esquejo on 19 February 2009 at the Philippines Band of Mercy Hospital. As you can see, his surgery went really well. It took less than an hour to put that big smile on his little face, a smile that will last for the rest of his life. Errol does not know how lucky he is. Most children born with clefts in the Philippines never receive surgery because they are too poor to ever afford it and there are no government programmes that provide it. 25% of people in the Philippines live on less than £1 a day, and most of the children we help live on much less. Without the Smile Train programme - and without donors like you - Errol would probably have suffered his entire life without ever receiving surgery. I hope that you put these pictures up on your fridge or somewhere else you can see them so they'll be a happy reminder that there is a little boy half way around the world smiling today thanks to you. On behalf of Errol and all the children we will help this year, I thank you. With the economic crisis and our donations being down %22, your generous gift could not have come at a better time. Powerful stuff, eh? What other charity can do so much for so little? I doubt my £10 per month could have bought me more satisfaction with any other charity. The other day I had a new hands free kit put in our car that also hooks up to an iPod. Annoyingly my iPod is the generation just before the oldest ones the hands free kit supports. So I went straight out and bought a shiny new iPod Nano in glorious orange and it cost £106. I'm not loaded by any stretch but I could afford to do that pretty much without thinking. £106 to someone like Errol is utterly unthinkable. When you can't even afford to have your face fixed, owning a new iPod must seem as unlikely as buying a Rolls Royce or flying to the moon. Thank God for the Smile Train and big up yourself Dr Esquejo. 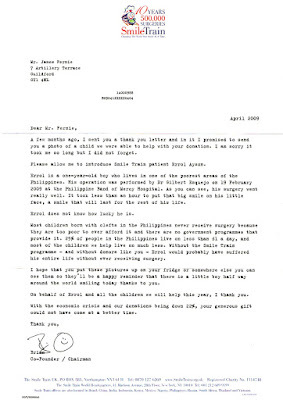 Here is the letter and before and afters of little Errol. Talk about the feelgood factor!